To gauge the competitive dynamics in the global district heating and cooling (DHC) market, the DHC system manufacturers, project contractors, and plant operators in the supply chain will have to be factored in, states a report by Transparency Market Research (TMR). In the coming years, big plant operators and private operators are predicted to start manufacturing DHC systems, which in turn, would likely heat up the competition. Competition would also be turned up by newer cutting-edge technologies, subsidies, and incentives. Under such a scenario, new entrants sans proper government patronage or large-scale infrastructure project handling capacity might find it difficult to gain a foothold in the market. This is because maximum risk is posed during the construction phase, which requires astute developers with sound financial standing. Some of the big names operating in the industry are ADC Energy Systems LLC, Emirates Central Cooling Systems Corporation (EMPOWER), Emirates National Central Cooling Company PJSC (Tabreed), KELAG Wärme GmbH, and Keppel DHCS Pte. Ltd. 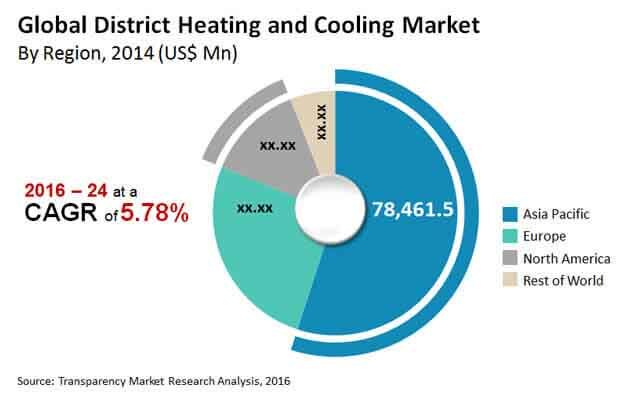 The global sales of district heating is slated to expand at a CAGR of 6.07% from 2015 to 2023 and the sales of district cooling is expected to register a CAGR of 7.3% during the same period. In terms of revenue, the global district heating market is predicted to reach a value of US$211.63 bn in 2023 while the district cooling market is expected to reach US$17.81 bn in 2023. District heating and cooling are together often referred to as district energy. Among the two, district heating is a more mature technology, which has resulted in its higher adoption across the world as compared to cooling. In fact, district heating commands a lion’s share of the market and is slated to maintain its dominance in the coming years as well. In 2014, for example, its market share vis-à-vis district energy sales was a staggering 93.76% globally. The district heating market enjoys a stronghold in Asia Pacific, Europe, and North America, where installations date back to decades. In terms of both volumes and revenue, Asia Pacific has dominated the market. In 2014, the region topped the district heating energy sales by accounting for a 55.14% share. Its share is slated to further increase in the coming years. China is the leading market for district heating both in Asia Pacific and globally. Robust policy-based support mechanisms and the expansion of district heating networks to regions wherein DH infrastructure is underdeveloped are some of the major driving factors for the market in China. The primary factor benefiting the global market for district heating and cooling is its cost effectiveness and better returns on investments through economies of scale. “It has been observed that opting for a DHC system helps reduce overall boiler costs and staffing expenditures, and boosts boiler efficiency; additionally, DHC systems are more beneficial for the environment. As the DHC system is shared among numerous households, it leads to better capacity utilization and fuel efficiency as compared to stand-alone boilers, which are completely dependent upon the demand profiles of individual households,” explains the analyst of the TMR report. Hobbling the market’s growth, points out the analyst, is high initial investments in constructing the plant, building extensive underground pipeline networks, and connections. Besides this, the payback period is long enough to deter new players from entering the industry. “Factors such as relatively nascent technology, lower progression along the learning curve, and high risk perception by investors significantly raise the overall cost of financing DHC projects,” adds the analyst.